If you've ever given a deposition, you've been asked whether you wanted to "read and sign" at the end of it. 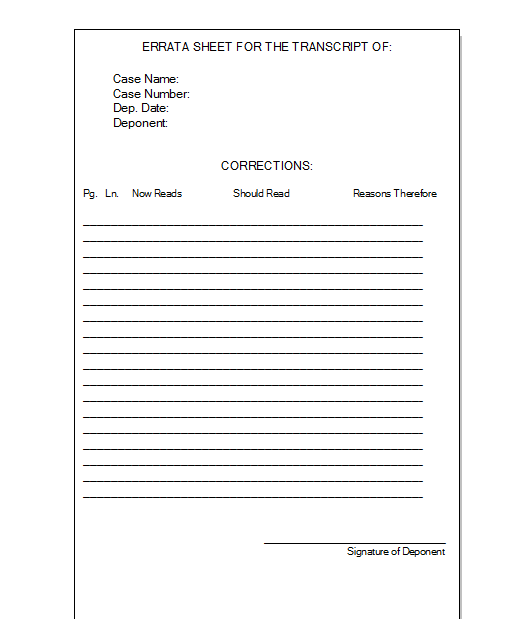 To read and sign a deposition simply means that the witness reads through the transcript once it's prepared and notes any changes or corrections that are necessary on what's called an errata sheet. The witness then signs and dates the errata sheet and returns it to the court reporter. What happens to the errata sheet then? In most cases, when a witness returns the errata sheet there are zero or very few changes noted. The court reporting firm then makes copies of the completed errata sheet for each attorney, attaches the original errata sheet to the original transcript, and places the original transcript in a sealed envelope. The original transcript is then sent to the attorney who took the deposition, so it can be filed with the court if and when necessary. Witnesses are often advised that they are not allowed to change the substance of their testimony, but are to only change errors such as misspelled words, mistranslated words (when converting from shorthand), and dropped words. In some instances, court reporters receive errata sheets that are three, four, five, even ten pages long, and which contain completely rewritten paragraphs. The court reporter handles those errata sheets the same way they handle an errata sheet with zero or very few changes noted. It's important to note that even when substantial changes are noted on the errata sheet, the original transcript itself is not changed - both remain part of the official court record in the case. If the deposition transcript ends up being introduced at trial, both transcripts can be read so the trier of fact (whether the judge in a hearing or bench trial, or a jury) can determine the "honesty of alteration." Also, if the witness does not provide the reason for each change, the witness can be held to their original testimony if courts determine there was not a legitimate reason. In one case, appellate courts ruled that the "absence of statement of reasons indicated that corrections were purposeful rewrites made to manufacture factual issues" and the corrections were stricken. Filling out an errata sheet and signature page are very easy. For directions, please watch this video.